When it comes to knitting, every stitch (and every second!) truly does count. I know I’m not the only one who takes my project with me everywhere I go….simply so I might get a few more stitches worked during a second of down time! This free sock knitting pattern is perfect for converting those spare seconds into completed stitches. With an easy to memorize stitch pattern, this project is one you can work on the go. So stop wasting time, cast on this easy knit sock pattern, and get stitching! 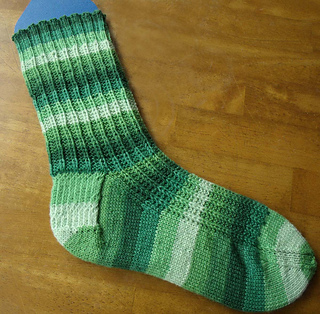 Thank you to Mary E Rose Designs for contributing this wonderful free sock knitting pattern to the Melody’s Makings blog.